3D printing has opened up new possibilities, but it’s important to keep a few fundamental principles in mind when designing for additive manufacturing processes. These 3D-printing design essentials will guarantee a smooth transition from CAD to final part. Learn useful tips for 3D printing. 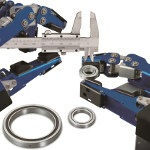 Linear motion guide technology pioneer THK is helping manufacturers overcome some of the critical challenges to meeting the demand for advanced service robots. The company’s miniaturized actuators and operating devices fit neatly inside the robot. In addition, THK’s portfolio of rotary actuators and components is playing a key role in developing the next wave of droid assistants. The same researchers who pioneered the use of a quantum mechanical effect to convert heat into electricity have figured out how to make their technique work in a form more suitable to industry. Engineers from Ohio State University describe how they used magnetism on a composite of nickel and platinum to amplify the voltage output 10 times or more. 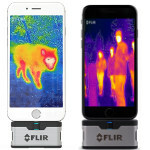 The third-generation FLIR ONE provides a powerful, introductory-level thermal camera that attaches to iOS or Android devices. Featuring the new OneFit adjustable-height connector, including a USB-C version for Android, the latest FLIR ONE easily attaches to more smartphones without needing to remove your phone case. As the most affordable FLIR ONE to date at $199.99, this unit is the perfect camera to introduce people to the benefits of thermal imaging. Also comes in a PRO version for $399.99. Available the first half of 2017. Servometer precision motion control couplings are available as both flexible bellows couplings and rugged beam couplings. Electrodeposited bellows technology offers seamless construction and the best combination of flexibility and strength among couplings technologies. These versatile, flexible nickel and stainless steel shaft couplings are capable of accommodating misalignments for parallel, angular, and axial motion. This newly released video showcases their unique characteristics, capabilities, design, and various applications. The RC Series of carbon composition axial leaded resistors from Stackpole is an outstanding choice for high-speed or high-energy pulse handling requirements. The large mass of the carbon resistive element efficiently dissipates high-energy surge events, while the almost negligible inductance allows for higher switching speeds than comparable wirewound resistors. Carbon Comp remains a favorite choice for switch mode power supplies as well as many other snubber and energy-dumping applications. It is also a popular choice for surge withstanding in meters and data collection devices as well as a variety of lighting products. 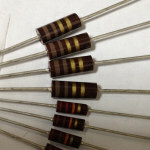 Available in 1/4-W and 1/2-W sizes in resistance values from 1 ohm up to 22 Meg ohm. Standard tolerances are 5 and 10 percent. More and more design engineers are relying on composite substrates in an effort to reduce costs and increase lightweighting possibilities in assembly. 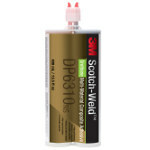 With this in mind, 3M has introduced 3M Scotch-Weld Multi-Material Composite Urethane Adhesives DP6310NS and DP6330NS to its growing portfolio of structural adhesives, which create durable bonds with minimal surface prep between medium- to high-energy surfaces like carbon fiber, fiberglass, reinforced plastics, and painted or unpainted metal. These versatile adhesives are the perfect place to start when using composites because of their universal application and ability to effectively lightweight assemblies for trucks, buses, RVs, specialty vehicles and passenger rail, and other markets like sporting goods and panels. The AT20-100 Motorized Vertical Lift Stage from Optimal Engineering Systems (OES) is a very stable, high-precision, high-load stage that can be easily integrated into almost any application. The large 120-mm x 180-mm (4.72-in. x 7.08-in.) drilled and tapped platform has a vertical travel of 100 mm (3.93 in.) and features: 3.315-µ (non- Micro-Step) resolution, 5-µ repeatability, and 15-µ positional accuracy. The precision-ground lead screw, precision linear bearings, and the rigid box construction of the moving component of the elevator stage assure smooth and flat vertical motion. Load capacity to 50 kg (110 lb). Applications include: testing, inspection, assembly, sampling, laser drilling, and machining in a broad range of industrial, medical, semiconductor, and research facilities. H2W has developed an unhoused arc segmented frameless brushless torque motor (TWR-070-410-1150-3PH) with low-inertia moving coil assembly for high angular acceleration applications. The rotary 3-phase brushless motor, also known as a rotary servo motor, is a direct drive motor that is ideal for limited or unlimited, closed-loop servo, rotary motion applications. It can generate a continuous/peak torque of 480 in.-lb [53 Nm]/1440 in.-lb [159 Nm]. A team of researchers at MIT has designed one of the strongest lightweight materials known by compressing and fusing flakes of graphene, a two-dimensional form of carbon. The new material, a sponge-like configuration with a density of just 5 percent, can have a strength 10 times that of steel. At the Army Research Laboratory in Maryland, scientists are on the hunt for nanomaterials that could improve engine technology in a big way. Their latest discovery -- involving copper, of all things -- could lead to many new materials applications, including inside turbine engines, where temperatures can soar to more than 2,500 degrees Fahrenheit. Some boundaries for long-endurance flight were broken this month when a DARPA-backed small business effort launched a uniquely designed, combustion-powered unmanned aircraft that stayed aloft for more than two days and two nights. It carried 20 lb of actual and simulated payload and was a further step toward demonstrating the system’s objective performance of carrying a 30-lb payload for 10 days at an altitude of 15,000 ft. The worldwide PI Group catalog of motion and control positioning solutions covers advanced ceramic hybrid drives, multi-axis piezo nanopositioning systems, stacked (linear+rotary) positioners, 6-axis Hexapod parallel, and award-winning photonics alignment engines. In the US, PI designs stages tailored specifically for the North American OEM market, in addition to air bearings.